Upgrading a portion of a major trunk road in the Eastern Cape province of South Africa has enabled palaeontologists to get a rare insight into the flora and fauna of an ancient Devonian ecosystem. In a press release sent to Everything Dinosaur by the South African National Roads Agency SOC Ltd (SANRAL), the creation of a cutting as part of road improvements, has exposed a highly fossiliferous shale deposit containing fossils of both plants and animals that lived more than 360 million years ago. The photograph above shows palaeontologist Dr. Robert Gess (Albany Museum in Grahamstown), with 360 million year-old invertebrate and plant fossils discovered outside Grahamstown, Eastern Cape province. The fossils represent a marine coastline ecosystem when what is now Eastern Cape was located at a much higher latitude, some fifteen degrees off the South Pole. Africa formed part of a huge, southern super-continent (Gondwana) that consisted of land that would eventually become South America, Antarctica, Arabia, Australia and southern Asia. This fossil site is especially significant as during the Devonian there was a great increase and diversity in terrestrial plants, which gradually spread inland from the coastal swamps. Many of the fossil finds, although not studied in great detail to date, indicate that there are a number of new species of plant and invertebrate likely to be documented. 360 million year old plant fossils. According to Dr. Gess, the plant and invertebrate fossil discoveries are from ancient open river mouth ecosystems. The location of Waterloo Farm and Grahamstown where a substantial number of Devonian fossils have been found. The team also retrieved the most complete specimens of the “fronds” of the Archaeopteris notosaria tree, which according to Dr. Gess is “the best preserved fertile material of this ancient tree on record”. 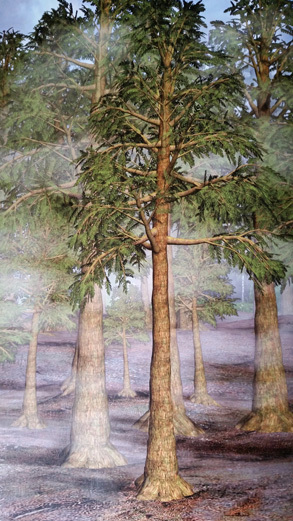 The Late Devonian Tree Archaeopteris. Dr. Gess and his field team have also discovered a number of new marine invertebrates. Just a few kilometres west of the main plant fossil localities and in slightly older strata, the field team also discovered linguloid brachiopod shells. A series of road repair and construction projects in this part of the Eastern Cape over the last two decades has helped palaeontologists to piece together prehistoric ecosystems from approximately 360 million years ago. For example, twenty species of Late Devonian fish have been found at the Waterloo Farm roadworks, these fossils have been found nowhere else in the world. In addition, the Waterloo Farm site has yielded fossils of terrestrial, freshwater flora and marine seaweeds plus invertebrate fossils representing the ancestors of today’s spiders and scorpions. Dr Gess explained that the black shale in which the fossils are found is very prone to weathering and in nature it is turned to formless clay before it reaches the surface of the ground. SANRAL plans to introduce a resting place and observation area along the N2 road so that members of the public can view the fossil site and learn about South Africa’s ancient past.